(Annapolis, MD)- An enormously successful 26th Annual Leukemia Cup was held on Saturday, June 2nd, 2018, to support the Leukemia Foundation, hosted jointly by Annapolis YC and Eastport YC. As a leukemia survivor, Annapolis’ own famous and legendary sailor, Gary Jobson, was a proud host for the event that raised thousands of dollars to support research and support for the Leukemia Foundation. 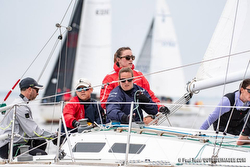 Dozens of J/Sailors participated in the event, sailing in a combination of one-design classes and PHRF handicap classes. Focused on having fun and raising funds for a worthy cause, J/classes included J/30s, J/35s, J/80s, J/105s and PHRF classes. In the five-boat J/30 class, it was Tristan & Sheila Keen’s INFECTION SMILE taking class honors. Topping the four-boat J/35 class was Bruce Artman’s T-BONE. Leading home the six-boat J/80 fleet was Ken Mangano’s MANGO. The eleven-boat J/105 class, the biggest contributors class-wise, saw John White’s USA 113 take the honors. In PHRF N Class, Steve Grimm’s PANDORA was 3rd. And, in CRCA-ORR division, it was Dan Leonard’s pretty J/100 FLASHPOINT winning class. For more Annapolis Leukemia Cup sailing information Add to Flipboard Magazine.